Assemblies of synchronously active neurons were suggested as the key mechanism for cortical information processing. Testing this hypothesis requires to observe large sets of neurons simultaneously, which is possible now due to recent advancements in electrophysiology. However, tools for analyzing such massively parallel data are lagging behind. Mere pairwise analysis is not sufficient to reliably detect synchronous spike patterns involving larger groups of neurons, and thus do not allow to conclusively identify assemblies. Instead methods that consider higher-order correlations are needed. Available tools for correlation analysis are not applicable, either because of the expected combinatorial explosion due to the required consideration of all individual spike patterns [1, 2], or, the methods are not designed to identify the specific set of assembly neurons [3–6]. Here we present a new method which detects and identifies neurons participating in assemblies, by combining the accretion method  with data mining approaches, in particular frequent item set mining (FIM). Thereby spike synchrony among groups of neurons is detected by the accretion approach: pairs of spike trains are tested for significant correlation and then reduced to new point processes containing only synchronized spikes. These processes are in turn correlated with single neuron spike trains and so on, until the maximal order of correlation is found. FIM algorithms help to fast and efficiently search the space of all neuronal subsets. However, FIM algorithms typically rely on a minimum support criterion to prune the search, since it guarantees soundness. In our framework, this criterion is not useful, since existence of higher correlation does not necessarily imply a frequent occurrence of spike patterns. We rather aim at selecting spike patterns that occur significantly more often than predicted by the spike and (lower order) coincidence rates. Therefore we employ the χ2 measure  in combination with the FIM algorithm still enabling to processes large data sets very efficiently. Using simulations of massively parallel spike processes that may contain various constellations of correlated activity (e.g., as A1, A3, A2 in figure 1; top panel) we illustrate that our algorithm is well suited for detecting and identifying groups of neurons exhibiting higher correlations. In particular, the approach is able to detect and separate neuronal groups of overlapping assemblies, irrespective of the number of assemblies individual neurons are participating in. 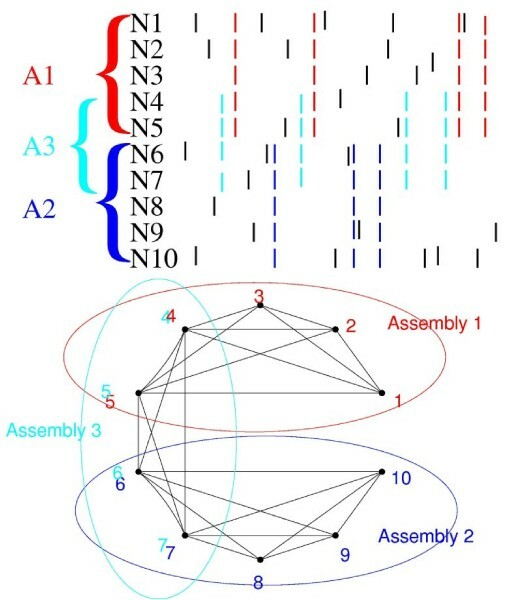 The extracted assemblies are visualized by graphs where the nodes represent neurons and edges significant pairwise correlation (Figure 1, bottom panel). Thus we provide a powerful tool for the detection and identification of correlated groups of neurons. Partially funded by BCCN Berlin (01GQ0413) and Helmholtz Alliance on Systems Biology.